In the Ace of Swords, we see a hand coming out of a cloud, holding a Sword. 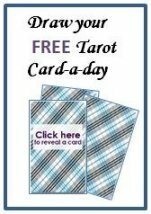 This card presents us with the opportunity of making a clear-headed decision. Today you may have the opportunity to make a clearly thought-out decision, or someone may offer you clear-headed advice. Will you take this advice, will you grab this opportunity whilst it is offered, or will you let it pass? There might be an unwillingness to make decisions or we might not know that literally the power is in our own hands. 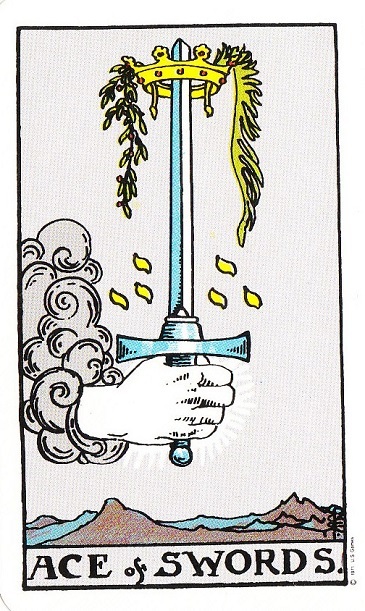 The card shows a hand coming out of a cloud and the swords represents the analytical mind so we have to rise above clouded thinking and then learn how to make (though) decisions in order to take control over our own life. 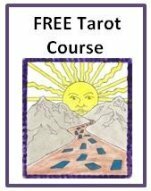 It is a decision making card and generally in a reading it is a really encouraging sign to make decisions. In my own life this card comes up when faced with any big decision buying a house or changing jobs. One good example that comes to mind is our decision to change our daughters schooling. At the time it was a tower event and things were happening very fast but what we did was make a decision based on rational thinking and this decision been very beneficial for all of us. When it is represented as a sword we often see just that; an image of a sword but like the Crowley deck it has many hints and suggestions in the way the art work has been created that give a stronger idea about the meaning of the card. In the Crowley deck you can see through the imagery that the analytical mind can give us clarity and strength. In the Celtic Dragon Tarot you can see for all Aces baby dragons hatching showing a strong element of potential within their individual suits.